This one is for my friends Judy and Chini. Here's why. I had mentioned on Facebook earlier in the week at how happiness was spelled out in 4 happy words. Those four words? Pumpkin Chocolate Chip Cookies! And, I'm not lying, they really are happy little bursts of flavor in your mouth. I've made them twice already this week. Both Judy and Chini saw my post and requested the recipe... so, for you guys, here it is. I hope you like them. Want to make some too? Of course you do and here is the recipe! Cream your sugars and shortening together. Add in your pumpkin, eggs and vanilla and mix well. Then, add in your cinnamon, soda, and salt and then mix again. I know usually you add those ingredients in with your flour but I think mixing them in first really helps the cinnamon get mixed in and spread throughout batter better. Then, mix in your flour. Once the batter is mixed together add in your chocolate chips. Notice I didn't put a measurement on the chocolate chips, I just use the TLAR system. You know, "that looks about right". I never go crazy with them though because if you get too many, they can over power the pumpkin flavor and well, that would be a crime. Then, drop by the spoonful onto cookie sheet and bake for 10 - 12 minutes in a 350 degree oven. Yum! In other news, today I'm crafting up some ghosts and jewelry. Not ghost jewelry or jewelry for ghost but two separate projects. Can't wait to show you!!! P.S. My sister, who lives in Utah, mentioned that she talked with a few women at Walmart last night who follow my blog. I just want to send out a BIG ol' shout out to you all! Thanks so much for following this little here blog. I hope your projects turned out just like you hoped they would. Smiles!!! Yum. I will replace the flour with my Pamela's. Sound sooo good. Thank you. Really enjoying your site! 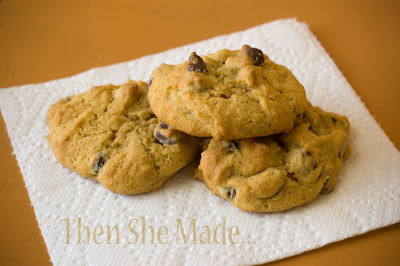 So funny that you did this post...I have been craving these cookies. This looks so yummy!! I'm pinning it to my pin bored and going to make them today! I'm excited to try these. They actually look like cookies instead of pumpkin blobs. Thanks for sharing. Or you can make these with a box of spice cake, can of pumpkin and chocolate chips. I, too, love pumpkin chocolate chip cookies and thank you for sharing your recipe. Although I didn't meet your sister in Walmart, I do live in Utah and have your blog bookmarked as one of my very favorites, in my folder "Cool Blogs" :) thank you for sharing your talents and your fun & interesting ideas. These sound awesome. How long do you bake them? At what temp? Then she made ... A friend! Spider Q&A & Skeletons - ewww!